“Seven Suicides – and they roared back as The Living Dead” . 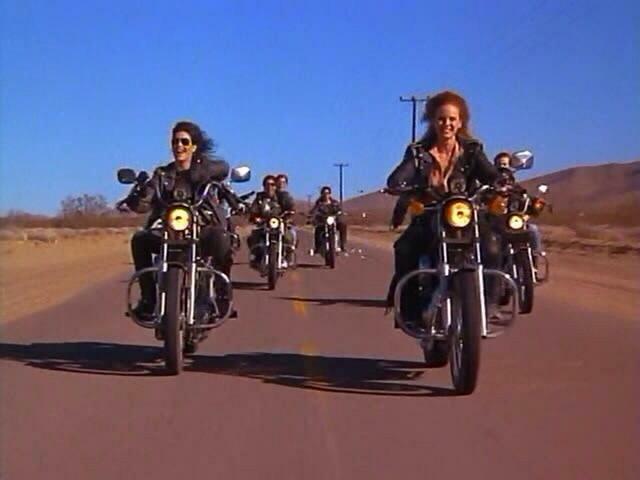 A motorcycle gang called the living dead all commit suicide, so that they can return back as one of the living dead. 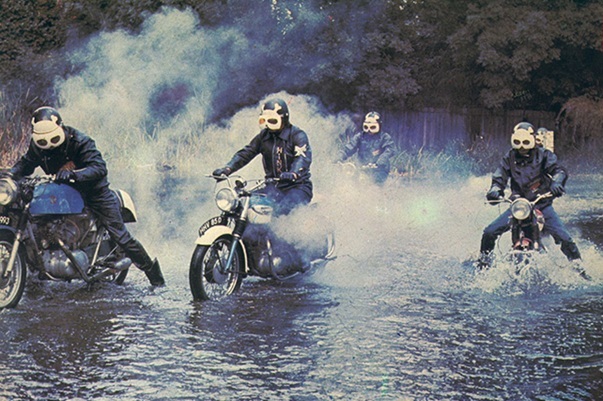 The film is a rather hilarious combination of motorcycles, witchcraft, and a splash of 1970’s hippieness. The plot, script, and acting are nothing to write home about. The things that are memorable are the motorcycle scenes, the biker’s look, and the music. There are a decent amount of scenes involving the bikes, including one where they go around a shopping center and parking lot. The bikers have a cool look, with the helmet and white visor that makes it look like a skull and crossbones. The soundtrack by John Cameron is pretty excellent, especially the opening title sequence with the gang riding around a Stonehenge type place. There is also an amusing burial scene of the gang leader, where a hippie is singing a song called “Riding Free,” while the dead gang leader is sitting on top of his bike in the grave. The soundtrack was actually released on CD in 2003 by Trunk records. 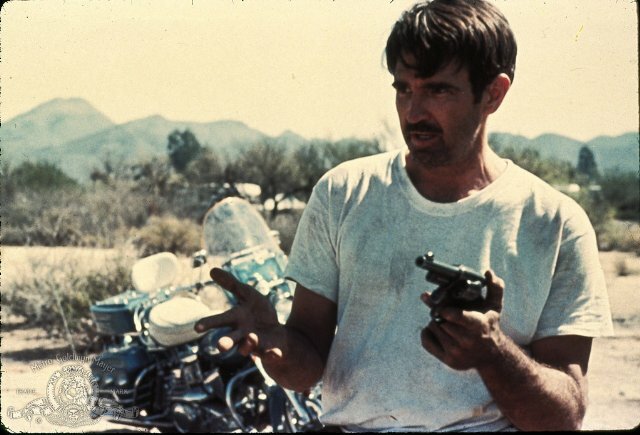 If you like biker movies, or drive-in movies, then you should check this one out. “Did you know that me and Alan Ladd were exactly the same height?” . This is by far the best overall movie on this list, with the biker story being from the perspective of the police force and motorcycle unit. The name has to do with the Harley Davidson Electra Glide motorcycle’s that are issued to the Arizona traffic officers and the story deals with one short officer John Wintergreen (Robert Blake), who wants to get transferred to the homicide division. He gets his opportunity when a suicide is determined to be a murder and there is $5,000 missing from the man’s home. This is an excellent forgotten crime drama with a great story that is played and filmed like a modern western. It features some beautiful exterior cinematography from Conrad Hall, who wanted the scenery to be reminiscent of John Ford’s western films. Hall had previously worked on some major pictures including Cool Hand Luke, In Cold Blood, and Butch Cassidy and the Sundance Kid. According to the DVD commentary, the director took a salary of one dollar in order to be able to afford the salary of Hall in the budget. It also features one of the great performances from Blake as the main character, who is best known for In Cold Blood, Baretta, and his wife’s murder trial in which he was acquitted. There are also minor appearances from the members of the band Chicago, who were being managed by the director of the motion picture. “Before Mad Max There Was STONE” . This is a low budget Australian biker movie about a detective that goes undercover in a biker gang in order to find who has been killing off members of the gang. The killings end up being political and the detective must choose between his job and his biker loyalty. 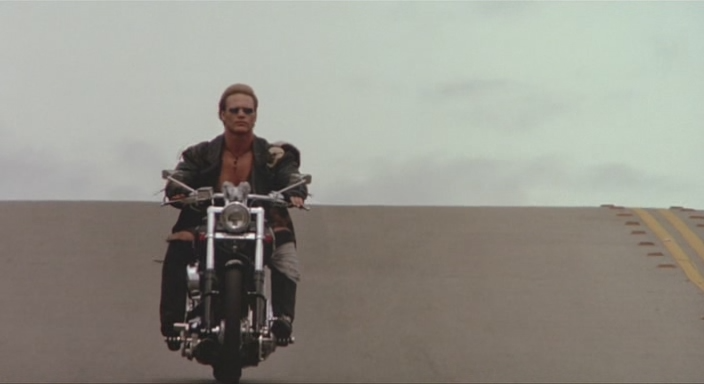 The film is known for its use of Kawasaki Z900’s as the bikes, fantastic location shots, a large funeral procession, and some very crazy bike stunts. One particularly insane stunt has one of the bikers killed by flying off of the edge of a cliff and falling 80 feet to his death into the sea. This movie also features four of the actors who would go on to appear in the more widely known Mad Max, which were Vincent Gil, Hugh Keays-Byrne, Roger Ward, and Reg Evans. It also featured almost 400 real bikers used as extras in the highway funeral procession scene. “Super Sisters on Cycles” . This is definitely the strangest blaxploitation film ever made and possibly the weirdest movie that I have ever seen, which is really saying something. 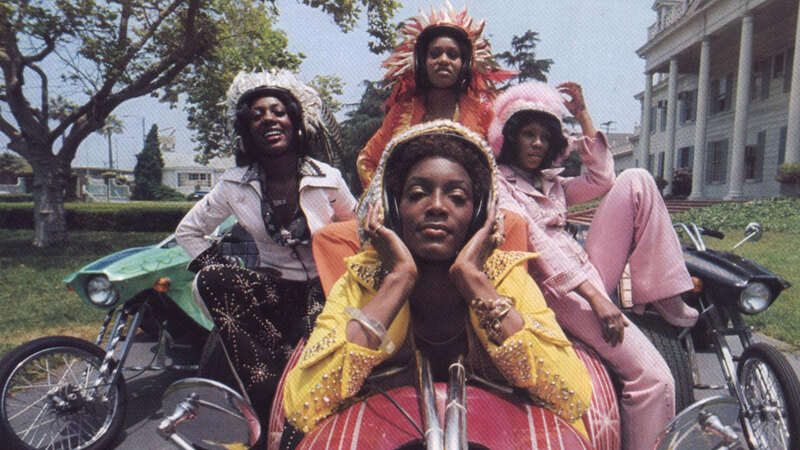 The story involves a group female disco looking bikers, with the main one searching for her missing mother. This picture is an unusual mix of silent era and Keystone Cops slapstick, Benny Hill, Looney Tunes, the 1966 Batman television show, the Naked Gun and Airplane type humor, and disco outfits and music. “Sworn to Fun…Loyal to None!!!” . A motorcycle gang gets into trouble in a small town when it stops to fix a broken down bike while on their way to races taking place in Daytona. This was the first writing and directing credit for Kathryn Bigelow, who went on to win two Oscars for the Hurt Locker and a nomination for Zero Dark Thirty. 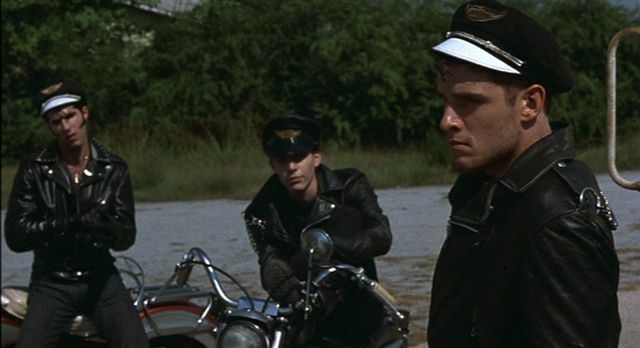 It was also the first major screen credit and role for Willem Dafoe, who stands out as the rebel biker. It was obvious watching this that he would go on to become a star and epic villain in other movies. The film oozes style and cool, between the 1950’s era costumes and vehicles to the excellent rockabilly score from co-star Robert Gordon. The motion picture and “script is a study in Americana that evokes influences as varied as Walker Evans, Kenneth Anger, Edward Hopper, and Douglas Sirk. As part of their rigorous preproduction research, the filmmakers utilized the resources of MoMA’s Film Study Center (our own Charles Silver is mentioned in the film’s credits). In that way, the Museum’s relationship with the film began well before it eventually entered our collection” . The production shoot took 25 days during the end of September, 1980, in a small town in Georgia just off of Route 17 . 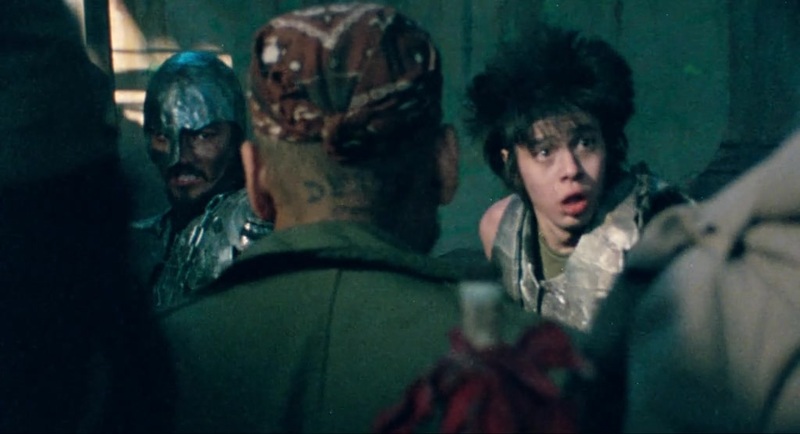 This is a Japanese film about a group of punk rock band and gangs set in a dystopian Japanese future where they play music, race cars and bikes, and fight each other. It is an unusual mix that is a combination of punk rock music, Mad Max, and Rock n Roll High School. It features actual Japanese punk rock bands The Rockers, The Roosters, and Stalin and most of the fashion in the picture was from the actual bands. They incorporated real concert footage into this and created the largest panic scene that had ever been filmed in Japanese history. It is a very strange and unusual movie that was something that most of the Japanese public had not seen before, but it would go on to inspire future Japanese films and the so called cyberpunk cinema. “They’re looking for a Few Good Men” . It is what it sounds like it is. 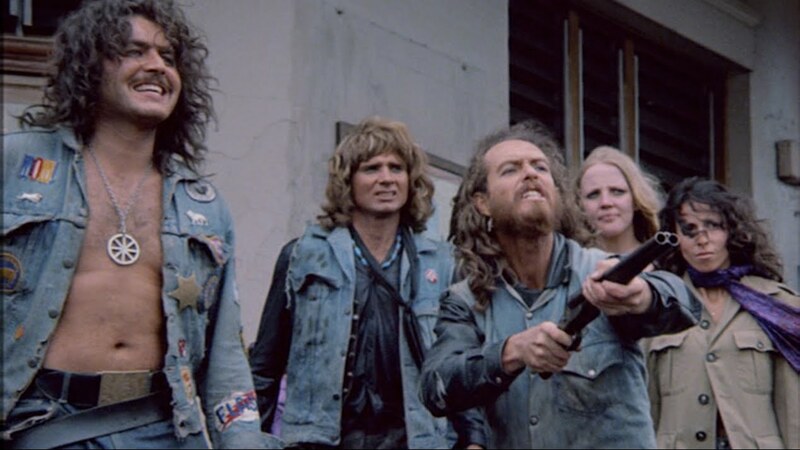 Brought to you by Lloyd Kaufman and your friends at Troma, a group of biker chicks arrive in a town where a mad scientist has been turning the local townsfolk into zombies for use as labor in an abandoned mine. The zombies escape and the biker chicks must fight them off in order to survive. It’s not some epic masterpiece. Its zombies, blind kids, midgets, and dikes on bikes. So everything that you would come to expect from a Troma release. It’s a B movie mash up of Russ Meyer’s super vixen movies and George A. Romero’s zombie films, providing silly music, cheeky dialogue, some jukebox dancing and singing, a bar fight, some chick fights, and lots of zombie heads flying off. It also features an early appearance from Billy Bob Thornton, which begs the question of how he managed to become a superstar and bag Angelina Jolie. If you like and are familiar with Troma, then you should find this one mildly enjoyable. It was the last film that they did a major theatrical release on, focusing more on limited independent theatrical releases and VHS and direct to DVD releases. “He’ll burn you cold” . Former football renegade turned actor Brian “The Boz” Bosworth plays a cop forced by the FBI to go undercover and infiltrate a dangerous and violent biker gang in Mississippi that has been suspected of murders involving government officials and drug dealings with the mafia. The film has received a lot of criticism and earned Bosworth a Razzie nomination. Despite the criticism, the film is highly entertaining, extremely violent, and filled with tons of action. It also features Lance Henriksen as the main villain, something that he excels at being. The final battle sequence that takes place in a government courthouse rivals any action sequences from any other pictures released during this time period and easily bests them.